Published: Feb. 27, 2015 at 04:27 p.m. Updated: Feb. 27, 2015 at 04:49 p.m.
Fourteen players who attended the NFL Scouting Combine had fathers who either were drafted or played professional football. 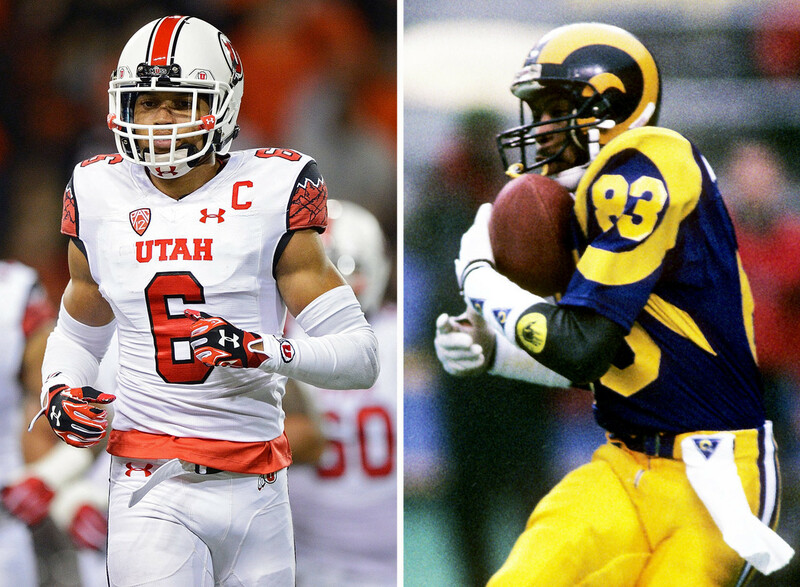 Here are some of the notable father-son football tandems. Father: WR Willie "Flipper" Anderson. He starred in college at UCLA, then played 10 seasons in the NFL (1988-1997) with the Los Angeles Rams, Indianapolis Colts, Washington Redskins and Denver Broncos. He was a second-round pick and holds the NFL record for receiving yards in a game (335 for the Rams, vs. New Orleans Saints in 1989). Son: Utah WR Dres Anderson. Father: RB Ken Bell. He played at Boston College, then made his mark as a kick returner with the Denver Broncos for four seasons (1986-89). He was undrafted out of college. Son: Nebraska WR Kenny Bell. Father: CB Tom Carter. He starred at Notre Dame, then was a first-round pick of the Washington Redskins in 1993. He played in the NFL for nine seasons (1993-2001) and also saw time for the Chicago Bears and Cincinnati Bengals. Son: Stanford CB Alex Carter. Father: DE Phillip Daniels. He was a star at Georgia, then played for 15 seasons (1996-2010) in the NFL with the Seattle Seahawks, Chicago Bears and Washington Redskins. He was a fourth-round pick. Son: Notre Dame WR DaVaris Daniels. Father: CB Mario Edwards. He played at Florida State, then for five seasons in the NFL (2000-04) with the Dallas Cowboys and Tampa Bay Buccaneers. He was a sixth-round pick. Son: Florida State DE Mario Edwards Jr.
Father: LB Britt Hager. He starred at Texas (he holds the school record for career tackles with 499), then played for nine seasons (1989-97) in the NFL with the Philadelphia Eagles, Denver Broncos and St. Louis Rams. He was a third-round pick. Son: Baylor LB Bryce Hager. Father: LB Willie Harper. Harper played at Nebraska, where he was an All-American in 1972. He enjoyed an 11-season NFL career (1973-1983) with the San Francisco 49ers (he also played for two seasons in the USFL). He was a second-round pick. Son: Fresno State WR Josh Harper. Father: LB Tom Hull. He played at Penn State, then played for two seasons (1974-75) in the NFL with the San Francisco 49ers and Green Bay Packers. He was a 12th-round pick. Son: Penn State LB Mike Hull. Father: G Todd Peat. He played at Northern Illinois, then had a six-season NFL career with the St. Louis/Phoenix Cardinals (1987-89) and Los Angeles Raiders (1990, '92-93). He was an 11th-round pick. He also played one season in the World League of American Football. Son: Stanford OT Andrus Peat. Father: WR Brett Perriman. He starred at Miami as part of a prolific receiver trio that also included Brian Blades and Michael Irvin. He was a second-round pick who played 10 seasons in the NFL (1988-97) with the New Orleans Saints, Detroit Lions, Kansas City Chiefs and Miami Dolphins. In 1995 with Detroit, he and Herman Moore became the first set of teammates to each have 100 receptions. Son: UCF WR Breshad Perriman. Son: Minnesota TE Maxx Williams.